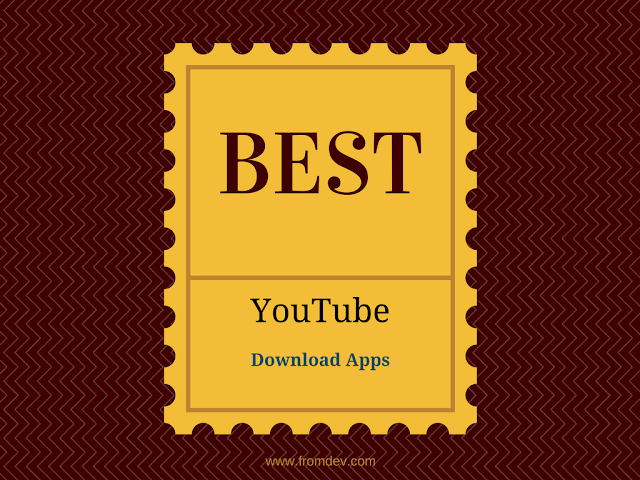 6 Best Apps That Make YouTube Video Download Easy! YouTube has turned out to be one of the favorite places for the people all around to watch videos online. After all, the recent increase in the media sharing has triggered the importance and benefits of YouTube widely. This digital platform proudly serves as a great environment for learning and kingdom of digital entertainment. This widely acclaimed platform offers it’s users and viewers a friendly interface and a large database of videos in different languages, which makes it all the way more popular and accessible. However, there may be times when you feel like re-watching a particular music video or a tutorial on YouTube but may give it a second thought as it will again consume the data and will leave you with a bill that could have been managed wisely. Nowadays, you can easily download YouTube videos on your PC via platforms like YouTube Downloader or YouTube Red. These download platforms turn out to be an efficient way of gaining you an access to your favorite videos, anytime by simply making the videos available on your PC. Nevertheless, if you wish to download any such video on your Smartphone, you’d be glad to know that you can always opt for an android app to download videos from YouTube. These apps are quite handy and user-friendly and with them, you favorite YouTube videos remain just a hit away. Regarded as one of the notable android apps to download videos from YouTube, TubeMate helps you download HD videos directly from YouTube, along with a high downloading speed. No matter what the video format is, this app will smoothly download any video without any hassle. The app also comes with a built-in video player which will play the videos that you’ve recently downloaded. The best part of using TubeMate is that you can download several files at the same time. Another user-friendly app, YouTube Downloader has an established reputation among the people who download videos from YouTube frequently and have been searching for an apt platform. With this android app, you can subscribe to your favorite channel, create your playlist and download it directly to your device. This app gained its popularity for the reason that it allows high-speed download of YouTube videos, even during the slow internet connection. The app uses multi-connections, concurrent threads, and resume break points download technology for attaining this speed. A 100% free android app , WonTube lets you watch your favorite YouTube videos without the hassle of buffering along with downloading them. The app is topped up with a built-in notification feature, which means that you will be notified once your download is complete and ready to be played. If you use 3g or 4g internet connection on your Smartphone, then this app will turn out to be a boon for you while downloading YouTube videos. Vidmate happens to be an appreciable app which also lets you watch live TV on YouTube, apart from merely downloading your favorite YouTube videos. This app is loaded with features that make sure that the user is left content after downloading his/her favorite YouTube videos. Being one of the oldest android apps that have been used to download YouTube videos, EasyTube possesses numerous features that make the app worth appreciating. The app has a built-in advanced search box which can directly search the videos on YouTube for you. One you have selected the video to download, you can then select the size of the video and finally the format. Though the aforementioned apps can download the videos with various extensions and formats, you can always opt for the online video converter to convert your favorite video into the desired format. One of the best video converters is Online Video Converters, which offer one of the fastest conversion rates for downloaded videos. On an average, they offer the conversion of a five-minute long video in approximately a minute. They are compatible with YouTube, Vimeo, and many other video sharing sites. If you happen to own an android phone, you can easily convert videos in different formats via this platform. After all, Online Video Converter is an effective and safe option when video conversion is considered. Andrew is a tech freak and loves latest gadgets. He is a self-motivated person and passionate about the work. In his free time, he loves to write about the gadgets, technology, apps, software, etc.